Truth be told, sadly, this is no where CLOSE to the most amount of pills I’ve had to consume in a day. Hi Azazura,Thanks for that caring post! 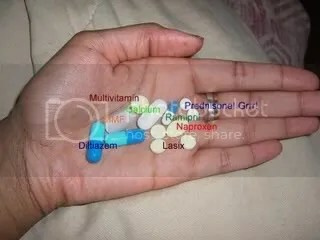 I take prednisone and plaquenil as well….and a lot of other stuff too as you can see from the pictures! 🙂Thanks again, I really appreciate that comment! When I was at my sickest, I was taking 30 pills a day. Now, only 9. Praise God, those were hard times.